Apollo, known as one of the great ‘Sun deities’ in history, had significant influence on humankind and, like his counterparts, Thoth, Viracocha, Mithra and Surya, imparted learning and wisdom to selected mortals who would be left to steer civilizations in the right direction. Scholars agree that Apollo existed before the Olympian pantheon and Herodotus recorded that he was first known by the Hyperboreans—an ancient and legendary people to the north. The seeds of ‘Western Civilization’ were sown in Greece, beginning with Pythagoras. This article is about the precepts of Apollo that Pythagoras and the Greeks of his time established for posterity. After genetically engineering humanity as we know it today, most of the Solar Rulers withdrew to the Sun during the 6th Century BC (identified by the ancient Greeks in those days as being the third century of the Olympiad). Having spent about 10,000 years (since the end of the last ice-age) coaching modern Homo-sapiens in the ways of husbandry, mineralogy, astronomy, construction, and community living, it was time to stand back and allow humans to embark on a new era of civilization. The foundations had been laid and it was time for humanity to develop science, philosophy and spirituality, so as to come to know their true identity and find their sense of purpose, freely and willingly. But they would not be thrown in the deep end and left untended. By this time the world population was nearly 100 million people: 85,000,000 in the Eastern hemisphere and 15,000,000 in the Western Hemisphere - primarily Mesoamerica - Mexico, Central America, Colombia, Peru and Venezuela[i]. Almost all of these had alien nuclear DNA in them – if not from our Solar Ancestors, then from the visitors from the Pleiades, Orion and Arcturus – the stars that were noted by Job in the Bible[ii]. (Note they all came from stars rather than planets). So, effectively Homo-sapiens was already a hybrid race then, as we are today. In the 6th Century BC there remained on Earth some of the Watchers, Sun-People who were left behind to supervise, teach and guide us. There were also the pure offspring of the Watchers who had taken on the attributes of ethereal Solar lightbodies and remained around the planet in higher dimensional realms. These beings may be described as ‘incorporeal,’ meaning not only that they were not incarnated in mammalian bodies, but neither were they subject to the material longings that torment humans. Then there were the genetically mutated Homo-sapiens and their hybrid descendants, whose solar psyches had become ‘Sun-spirits trapped in human bodies’ and subject to the laws of physical incarnation. During the 6th Century BC, now that Egypt was no longer home to the legendary Sun ‘deities,’ there were struggles for supremacy among the human civilizations. The Persians seemed intent on world dominance. Having conquered Babylon, they set about installing Cambyses, son of Cyrus, as the first Persian Pharaoh in Egypt. The great teachers of Greece (such as Pythagoras) did still travel to Egypt to meet enlightened beings, but by then the ancient Egyptian mystery schools were going underground, the predecessors of the Essenes and Therapeutae. Pythagoras, then later Empedocles, then Plato, passed on secret traditions to initiates. The rebuilding of the Second Temple by the Hebrews had not yet begun, although Cyrus had already allowed Jews in Babylon to return to Jerusalem. In Persia itself, Zoroaster had formed the basis of a monotheistic religious doctrine, calling his god by the name of Ahura-Mazda, which captured the imagination of the new leader, Darius. Simultaneously, Judaism was embarking on the period of revelations which would span from Daniel to John, paving the way in future for Christianity and Islam. It was a time of prolific writing by the Jews and many of the Old Testament books were now being completed. Many Biblical personalities were still around during this century 600 to 500 BC, including Ezra, Jeremiah, Haggai, Zachariah and Jeshua, but most notably Ezekiel and Daniel. They were on speaking terms with the Pharaohs and often greeted illustrious visitors from Greece, among them Pythagoras as well as Anaximander and Heraclitus. In Rome, the last of the Tarquinian kings was vainly trying to defend his throne against the rising tide of a republic. The monarchy finally fell in 509BC and the first pair of consuls was elected. Down in Sicily, colonies were being established by migrants from the Greek Islands, who established a new seat of learning and built the marvellous Valley of The Temples at Agrigento, including a temple dedicated to Apollo. Far to the East in China, Confucius was formulating his ideology while his mentor, Lao Tze, laid the foundation for Taoism. In India the Buddha, Siddhartha Guatama, attained his enlightenment around 525BC. He and his disciple Ananda set a religion in motion that was to rival Hinduism for the hearts of the people. Meanwhile, India’s Solar ‘deity,’ Surya, returned to the Sun, appointing the hybrid Rama to stay on (as related in The Epic of Ramayana) - the Gandhara Kingdom had already become a multicultural focal point over the past millennium (1500 to 500 BC). So there was a tidal wave of spiritual awakening sweeping over the planet during the 6th century BC. The early Fisher Kings were conducting religious rituals in Tara, Ireland. The mystical kingdom of the Olmecs was established, based at the sacred city Monte Albán, Mexico. They continued building pyramids, interacting with other Mesoamerican regional states such as Teotihuacan. Apollo’s appearance and activity in Greece dates from the 8th century BC. In Hellenistic times, as Apollo Helios he became identified among Greeks with Helios, Titan god of the Sun. He became the god of shining youth, the protector of music, spiritual-life, moderation, harmony and order. Medicine and healing are associated with Apollo, as well as his son Asclepius. Amongst his custodial charges, Apollo became associated with dominion over colonists and was the patron defender of herds and flocks. As the leader of the Muses (Apollon Musegetes) and director of their choir, Apollo functioned as the ‘patron god’ of music and poetry. Hermes created the lyre for him, and the instrument became a common attribute of Apollo. Hymns sung to Apollo were called paeans. Apollo has been variously recognized as a ‘god’ of light and the Sun, truth and prophecy, healing, music, poetry, archery and more. In archaic Greece, even during his absence, Apollo continued to speak through his oracle: the sibyl or priestess of the oracle at Delphi, known as the Pythia; she had to be an older woman of blameless life chosen from among the peasants of the area. Succeeding Pythia would sit on a tripod seat over an opening in the earth when receiving and conveying Apollo’s messages. The temple had the statement "Know thyself", one of the Delphic maxims attributed to Apollo, carved into it. During his time on Earth, he would depart each winter and return in the spring. This gave rise to an annual spring festival called the "Theophania", celebrating his return. The early Romans carried on Apollo’s teachings and respected the traditions of Delphi. Rome's seventh and last king, Lucius Tarquinius Superbus, after witnessing a snake near his palace, sent a delegation including two of his sons to consult the oracle. When Nero came to Greece in 66AD, he took away over 500 of the best statues from Delphi to Rome. Subsequent Roman emperors of the Flavian dynasty contributed significantly towards its restoration. The oracle flourished again during the rule of Emperor Hadrian, who is believed to have visited it twice. Hadrian offered complete autonomy to the city. Plutarch was a significant factor too, by his presence as a chief priest. Barbarian raids commenced during the reign of Marcus Aurelius. The tradition survived until AD 390, when the Roman Emperor Theodosius I silenced the oracle by destroying the temple and most of the statues and works of art in the name of Christianity. The site was completely destroyed by zealous Christians in an attempt to remove all traces of Paganism. Ultimately though, the precepts that Apollo had introduced were to become the basis of Western Civilization, established by his mortal hybrid descendant, Pythagoras. Apollo had many earthly liaisons and, by Pythais came Ancaeus, the founder of Samos, and one of his descendants was another called Pythais (or Pythasis), the mother of Pythagoras (whose father was Mnesarchus)[iii] . Many legendary heroes have been said to have slain dragons or snakes (usually considered to be a symbol of evil or wrongdoers). In Apollo’s case he was reputed to have slain a python, probably meaning an interstellar alien, at the site that would become known as the Omphalos, the sacred navel-stone and mid-point of the earth, where Apollo's temple was built. The pythian prefix was used commonly thereafter, with the Pythian Games, the oracular Pythia and, eventually, Pythagoras’ own name. Pythagoras was a philosopher, mathematician and mystic who founded the school of Pythagoreanism. He was the first to understand the relationship between the octaves of music and geometry, and the first to introduce to the doctrine of reincarnation to the Western world (known then as metempsychosis or transmigration of the soul). He left his native city about 530 BC for Crotona, a Greek colony situated in Calabria, in Southern Italy, where he founded a religious, political and philosophical school known as the Pythagoreans. According to Iamblichus, the Pythagoreans followed a structured life of religious teaching, vegetarianism, common meals, exercise, reading and philosophical study. Music featured as an essential organizing factor of this life: the disciples would sing hymns to Apollo together regularly; they used the lyre to cure illness of the soul or body; poetry recitations occurred before and after sleep to aid the memory. The key to the whole Pythagorean system, irrespective of the particular science to which it is applied, is the general formula of unity in multiplicity: the idea of the One evolving and pervading the many. This is commonly known as the Doctrine of Emanations. Pythagoras called it the Science of Numbers. An inner circle of his students were notable for wearing long hair, being vegetarians and having no personal property. This inner brother/sister-hood maintained vows of secrecy and were taught that reality was mathematical in nature. The mystical aspects of this Pythagoreanism held that philosophy tends to purify the psyche and that the Higher Self can attain to Union with the Divine. 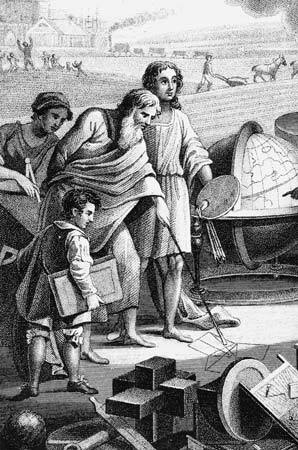 The Pythagorean school regarded geometry as being the highest form of mathematical studies, which were seen as being a direct approach to reality. Pythagoras was deeply struck by how, on the seven string lyre, harmonious notes were obtained when the lengths of those strings was proportional to whole numbers e.g. 2:1, 3:2, 4:3. The number 10 was deemed particularly significant. May students today know his name from the famous ‘Pythagoras Theorem’ concerning right angled triangles, demonstrating that the square of Hypotenuse is equal to the sum of the squares of the other two sides. According to the records, there are two main ways that Apollo continued to reach out to Pythagoras from his higher dimensional abode. From the writings of Porphyry (324 – 305 AD) we learn that the father of Pythagoras, Mnesarchus, found an infant boy, who was lying under a tree, staring at the Sun without blinking – a Solar baby, in fact – and he took the child in. He named him Astrasus (also called Astraios) and this child grew up as a brother and advisor to Pythagoras. The following verses are taken from Porphyry’s Life of Pythagoras . In Verse 10 of that account, we are told: “Mnesarchus […] found an infant lying under a large, tall poplar tree. On approaching, he observed it lay on its back, looking steadily without winking at the sun. In its mouth was a little slender reed, like a pipe; through which the child was being nourished by the dew-drops that distilled from the tree. This great wonder prevailed upon him to take the child, believing it to be of a divine origin. The child was fostered by a native of that country, named Androcles, who later on adopted him, and entrusted to him the management of affairs. On becoming wealthy, Mnesarchus educated the boy, naming him Astrasus, and rearing him with his own three sons, Eunestus, Tyrrhenus, and Pythagoras; which boy, as I have said, Androcles adopted”. In Summary: This was the beginning of Western civilization, which was conceived of and purposefully initiated by the great Solar Personality, Apollo, and enacted first by his chosen intermediary Pythagoras, followed by Empedocles in the following century, and on down through the Greek Mystery Schools. To the unenquiring mind, it looks as though the Sun Kings left us humans alone from the 5th Century BC onwards; however they are still among us, some on the material plane and others on the Intelligible plane. Since the 1980’s there has appeared a number of children born who are conscious of being Sun-children right from birth. They have become commonly known as Indigo Children or Star Children. Some of us may be Watchers. And this civilization may be finite – there might well be a projected end. For reference, the appendix below reproduces several of the relevant verses written by Porphyry about the Life of Pythagoras. Appendix: Selected verses from Porphyry’s Life of Pythagoras (See footnote iii). 10. Diogenes, in his treatise about the Incredible Things Beyond Thule, has treated Pythagoras's affairs so carefully, that I think his account should not be omitted. He says that the Tyrrhenian Mnesarchus was of the race of the inhabitants of Lemnos, Imbros and Scyros and that he departed thence to visit many cities and various lands. During his journeys he found an infant lying under a large, tall poplar tree. On approaching, he observed it lay on its back, looking steadily without winking at the sun. In its mouth was a little slender reed, like a pipe; through which the child was being nourished by the dew-drops that distilled from the tree. This great wonder prevailed upon him to take the child, believing it to be of a divine origin. The child was fostered by a native of that country, named Androcles, who later on adopted him, and entrusted to him the management of affairs. On becoming wealthy, Mnesarchus educated the boy, naming him Astrasus, and rearing him with his own three sons, Eunestus, Tyrrhenus, and Pythagoras; which boy, as I have said, Androcles adopted. 11. He sent the boy to a lute-player, a wrestler and a painter. Later he sent him to Anaximander at Miletus, to learn geometry and astronomy. Then Pythagoras visited the Egyptians, the Arabians, the Chaldeans and the Hebrews, from whom he acquired expertery in the interpretation of dreams, and he was the first to use frankincense in the worship of divinities. 12. In Egypt he lived with the priests, and learned the language and wisdom of the Egyptians, and three kinds of letters, the epistolic, the hieroglyphic, and symbolic, whereof one imitates the common way of speaking, while the others express the sense by allegory and parable. In Arabia he conferred with the King. In Babylon he associated with the other Chaldeans, especially attaching himself to Zabratus, by whom he was purified from the pollutions of this past life, and taught the things which a virtuous man ought to be free. Likewise he heard lectures about Nature, and the principles of wholes. It was from his stay among these foreigners that Pythagoras acquired the greater part of his wisdom. 13. Astrasus was by Mnesarchus entrusted to Pythagoras, who received him, and after studying his physiognomy and the emotions of his body, instructed him. First he accurately investigated the science about the nature of man, discerning the disposition of everyone he met. None was allowed to become his friend or associate without being examined in facial expression and disposition. 28. It is well known that he showed his golden thigh to Abaris the Hyperborean, to confirm him in the opinion that he was the Hyperborean Apollo, whose priest Abaris was. A ship was coming into the harbor, and his friends expressed the wish to own the goods it contained. "Then," said Pythagoras, "you would own a corpse!" On the ship's arrival, this was found to be the true state of affairs. Of Pythagoras many other more wonderful and divine things are persistently and unanimously related, so that we have no hesitation in saying never was more attributed to any man, nor was any more eminent. 29. Verified predictions of earthquakes are handed down, also that he immediately chased a pestilence, suppressed violent winds and hail, calmed storms both on rivers and on seas, for the comfort and safe passage of his friends. As their poems attest, the like was often performed by Empedocles, Epimenides and Abaris, who had learned the art of doing these things from him. Empedocles, indeed, was surnamed Alexanemos, as the chaser of winds; Epimenides, Cathartes, the lustrator. Abaris was called Aethrobates, the walker in air; for he was carried in the air on an arrow of the Hyperborean Apollo, over rivers, seas and inaccessible places. It is believed that this was the method employed by Pythagoras when on the same day he discoursed with his friends at Metapontum and Tauromenium. Through ten or twenty ages making search." 31. Indicating by sublimest things, and, he surveyed all existent things, and the wealth of the mind, and the like, Pythagoras 's constitution of body, mind, seeing, hearing and understanding, which was exquisite, and surpassingly accurate, Pythagoras affirmed that the nine Muses were constituted by the sounds made by the seven planets, the sphere of the fixed stars, and that which is opposed to our earth, called "anti-earth." He called Mnemosyne, or Memory, the composition, symphony and connexion of then all, which is eternal and unbegotten as being composed of all of them. [ii] The visitors from the Pleiades, Orion and Arcturus are the three noted in the 6th century BC writing known as the Book of Job in the Bible: see Job Ch.38 Vs.31/32.